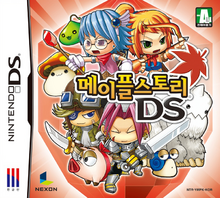 Note: Copy any of the above MapleStory DS (Korea) rom download links and paste it into your browser to download. tHEY DON'T WORK FOR ME y? why delete it in 24 hour? it's as illegal as what romulation has to offer in the first place..
not that im complaining. i am a happy r4i user. I downloaded maple story on my NDS R4 en could play someone can help me? i'm downloading it! :) i was looking at every download site for this game! now i have a good site, THANKS YOU KAMRAN WEB! how do i get past the white yeti guy with the warning? yeti at the beggining doesnt let me go in. Guys is there a English ver? can giv me link wat emulator can play this game? Guys. Maplestory DS isnt coming to america. I'm pretty sure it is. since nexon already announced it! English version is not out yet! it wont load. it says "Data Loading Failed!" at the yeti screen.